A special medical camp was held at Kilinochchi Santhapuram Kalaimagal Vidyalayam on 05th April 2014. 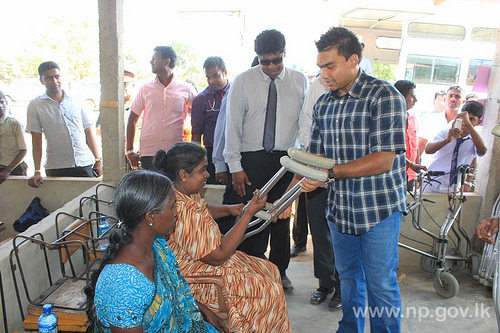 This was organized under the guidance of Parliamentarian Namal Rajapaksa by Health Ministry for health enhancement of the people who resettled at Santhapuram and Ambalnagar in accordance to a concept of the Mahinda Chinthaya. “Tharunayata Hetak” organization sponsored the camp. Parliamentarian Namal Rajapkasa and Governor of the Northern Province GA Chandrasiri participated and inaugurated the programme. 602 people benefitted at this medical. RDHS, Kilinochchi Dr.Karithikeyan also participated in this event.